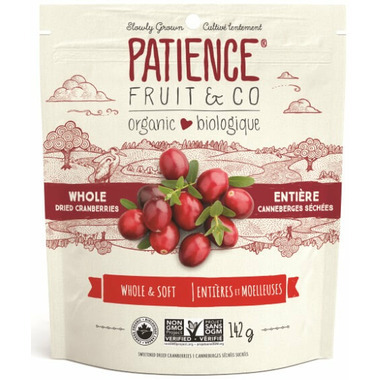 View all products by Patience Fruit & Co. These dried cranberries are processed from sound and mature cranberries, well coloured and tasty, and first quality. They are infused in a sucrose solution. Following the drying of the fruits, they are sprayed with a light quantity of sunflower oil. No preservative, flavour and colour is added. Certified organic, non-GMO and kosher. Grown in Canada. Fresh and amazing in salad and just on the go - so much better then the dried to death ones. A nice little addition to my salad addiction! I was really surprised by how big and plump these cranberries are, so much nicer than any of the others I've had. Along with pumpkin seeds, these have given salad so much more taste and pizzazz! Best way to get me to eat more raw greens! I like these cranberries because they are organic and they taste great! Soft, just like they advertise, and the juiciest dried cranberries I've ever had. 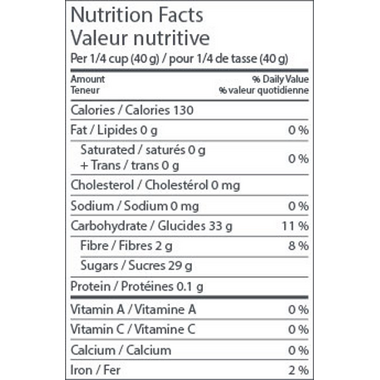 I especially like that they are not sweetened with sugar, but with apple juice. If I didn't have the sweetened with Apple juice to compare, these would be great, but they're not as soft as the other. My granddaughter spits them out. Consistent quality, delicious, use in salads and along with raisins when baking a sweet loaf. A great way to add additional nutrients. These are very nice and tasty cranberries. I bought them for using on salad, but I find them a bit big and plump for that and they are so tasty that I just want to snack on them instead. I really like this product. I add a few to my daily salads. I also use them to mix with other items to make small daily take with me healthy snacks. I've also tried the one that was sweetened with apple juice. Which I prefer the flavour of, however theses are still AMAZING, not overly sweet and very plump.